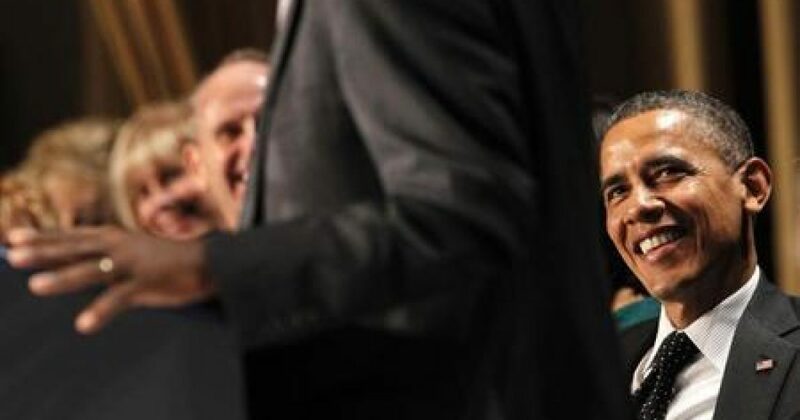 Pro-choice/gay marriage Barack Obama angered some constituents when he dragged his sleepy gum-chewing self to the 61st Annual National Prayer Breakfast. While there, Obama quoted Scripture, referenced Jesus’ “nail-scarred hands,” talked about America’s past racism, and predictably made a few jabs at perceived critics. Barack Obama even pled for unity while fostering disunity and suggested the nation exercise humility, while exhibiting none himself. The President was on the roster with politically incorrect Dr. Ben Carson who gave Obama a respectable prayer breakfast spanking. Carson, a world-renowned pediatric neurosurgeon, was unafraid in Obama’s presence. That’s probably because Dr. Carson has worked on brains just a tiny bit smaller than Barack’s. For those on the left there’s nothing worse than a black man refusing to play the victim, insisting that his success was achieved through individual freedom and personal responsibility. That’s why the President probably came real close to losing a waffle while listening to Ben share how, against all odds and without government assistance, he overcame poverty, racism, and a violent temper to become a world-renowned neurosurgeon. Benjamin Carson is a 61-year-old black man raised in Detroit by a single mother who refused to let her sons fail. As a peeved Obama stoically glared at him, Dr. Carson talked of his mother Sonya’s demand that, although unable to read herself, he and his brother Curtis, rather than watch television, read and write book reports. Clearly, Dr. Carson’s idea of ‘change’ is radically different from that of the president. Change for Ben Carson came with the revelation that the best one can be requires hard work and personal responsibility. Carson dared to touch on America’s “moral decay and fiscal irresponsibility” with Barack Obama, the main contributor to both problems, sitting just a few feet away. For mathematically-challenged Obama voters who find it hard to grasp the enormity of the nation’s 16.5-trillion-dollar liability, Carson broke it down by explaining that if one were to count “one number per second…it would take “507,000 years … to count to one trillion.” The doctor even brought up tax-free health savings accounts – now that takes a hearty dose of intestinal fortitude! Dr. Carson then asked, “Where does it say you have to hurt that guy? He just put a billion dollars into the pot!” The 2008 Presidential Medal of Freedom winner should have just turned and spoken directly to the presidential ‘winner’ sitting nearby, who was trying desperately to keep his composure. Unfortunately, Carson chose not to do that, but the unasked question dangling here is: Why are these two men so different? Both are black males abandoned by their bigamist fathers and raised by single mothers. Each one married an accomplished woman, and both reached the pinnacle of achievement. Yet, despite the fact that Dr. Carson would probably happily release his college transcripts if asked, the differences between the two far outweigh the similarities. Having performed surgery on a twin in its mother’s womb, Ben saved an unborn child. Barack, both philosophically and monetarily, supports the destruction of the children Dr. Carson saves. In the first book about himself, Dreams from My Father: A Story of Race and Inheritance, Barack shared his quest for identity, and peppered the journey with references to communist mentors, anti-Semitic pastors, and poetic, possibly made-up tales of racial animosity. On the other hand, quelling division rather than stoking it, Ben Carson writes uniquely American books with a Christian flavor that inspire people to be all they can be, such as Think Big: Unleashing Your Potential for Excellence. Carson’s recent book America the Beautiful: Rediscovering What Made This Nation Great, was co-authored by his wife, Lacena ‘Candy’ Carson. For the president, hearing sentiments like that coming from a black man had to be super cringe-worthy. That type of straight talk has the power to destabilize Barack Obama politically, because think of it – when a person of Dr. Ben Carson’s caliber receives accolades for his wisdom and successes, it proves that what defines a person in America is character, not color. All it took was one courageous man to step forward at a Washington DC breakfast event and unabashedly do what the pusillanimous Republican Congress seems unable to do – confront tyranny with truth. Unlike Barack Hussein Obama, Benjamin Solomon Carson exemplifies faith in Jesus and a grateful, patriotic view of America. The doctor accomplished miraculous things by exercising the type of humility the president talks about at prayer breakfasts, but clearly lacks. In the end, separating Siamese twins joined at the head and successfully performing hemispherectomies by removing half the brain of sick children must have infused Dr. Carson with the type of confidence needed to literally speak truth to power – directly to the President of the United States’ face.